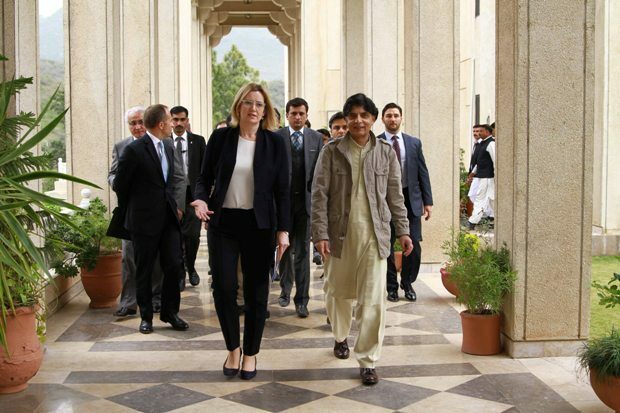 The Home Secretary, Amber Rudd, is on a three day visit to Pakistan and met with Pakistani Prime Minister Nawaz Sharif and Interior Minister Nisar Ali Khan earlier today. At a press conference with the Interior Minister, the Home Secretary gave a statement about her visit and talks with the Pakistani Government. Good afternoon. Thank you Your Excellency for that kind welcome and for the very constructive discussions we’ve just had. As Home Secretary, my priorities are mostly at home in the United Kingdom. But in our increasingly interconnected world, I know that ensuring security and justice for the British people requires us to work closely with important partners overseas – not least Pakistan. Our shared history, our global and regional challenges, and the 2% of the British population who trace their roots back to Pakistan, means that the UK has uniquely close ties to Pakistan. That of course includes the issues of security, immigration and justice for which I am responsible. But it also includes significant opportunities for our mutual prosperity, as Pakistan’s economy continues to grow and the UK takes advantage of its new relationships outside the EU. So I was delighted to accept the Interior Minister’s kind invitation to discuss how to enhance our partnership. I know that when she was Home Secretary, the Prime Minister greatly enjoyed and valued her working relationship with Minister Nisar. I look forward to building on that close understanding between our two countries. I would also like to pay tribute to the hard work of the Minister, as well as Pakistan’s police and its armed forces, in delivering significant improvements in security across Pakistan over the last two years. While we know that the challenges are still considerable, that hard work has brought increased security for the people of Pakistan and the UK, for British nationals in Pakistan, and for British businesses wanting to trade with and invest in Pakistan. As the Interior Minister has said, we have just had very constructive discussions on a wide range of shared interests. And that is reflected in the memorandum of understanding that I was delighted to sign with the Minister. Following on from these discussions, I look forward to enhancing our relationship in several areas. Firstly, in tackling the shared challenges from terrorism, extremism and organised crime. Pakistan has suffered more than most from the scourge of terrorism. We already work together closely to tackle these threats. But we can do more, which is why I’m pleased that the Prime Minister’s Special Envoy on Counter-Terrorism will be visiting shortly to expand our cooperation, structured around Pakistan’s own National Action Plan. I hope that will include further work on building Safer Cities, including here in Islamabad. Secondly, I want to see closer cooperation on extradition and mutual legal assistance, to ensure there is no escape from justice in either country. Last year saw the first extradition to the UK from Pakistan in over ten years, of a man later convicted of a double murder and jailed for 31 years. I look forward to that cooperation being the norm. Thirdly, on aviation and border security. When it opens later this year, Islamabad’s new airport will play an important role in the safe and secure movement of people between our two countries. I am pleased that we are supporting the airport’s development with training and expertise and hope to see more international flights coming to Islamabad in the future. I am also pleased that we are working closely together to tackle organised immigration crime. While my message is that the United Kingdom is open for business, both countries want to ensure our borders remain secure for the many legitimate travellers that move between the two countries each year. The Interior Minister also raised with me the situation of Altaf Hussain. I recognise the strength of feeling about this issue. As Home Secretary I cannot have any role in the independent decisions of the Police and the Crown Prosecution Service. But I can stress that the principles of British justice apply to everyone equally, with no exceptions. I assured the Interior Minister that, within my powers, I am committed to working closely with Pakistan to ensure our cooperation facilitates the application of justice in all cases. Before we take questions, I’d like conclude with my congratulations and best wishes on the occasion of Pakistan’s National Day this Thursday. As Pakistan celebrates its 70th anniversary this year, the UK is also proud to celebrate 70 years of diplomatic relations with Pakistan. That shared history is a strong foundation for our cooperation in the years ahead.